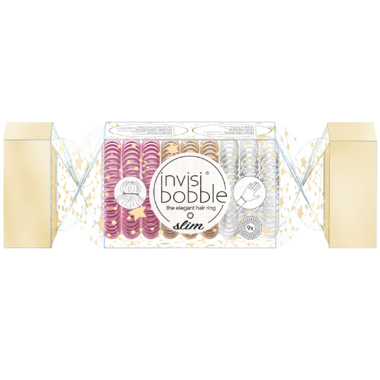 The Slim invisibobble in a fun and exciting holiday cracker. Great as a stocking stuffer, party favour, or as a treat for yourself! Good news ladies! There is no need to sacrifice style for comfort with the newest member of the invisibobble collection: The invisibobble SLIM is the perfect tool for both a stylish office hairdo and for a bouncy evening look. It looks delicate in the hair and like a fashionable bracelet around the wrist. Thanks to its spiral shape, the SLIM provides high wearing comfort. Since the SLIM hair tie does not soak, it is very hygienic, does not tangle and is gentle to the hair. Extra benefit: In case the invisibobble begins to lose shape, pour hot water over it – this will shrink it to its original size.